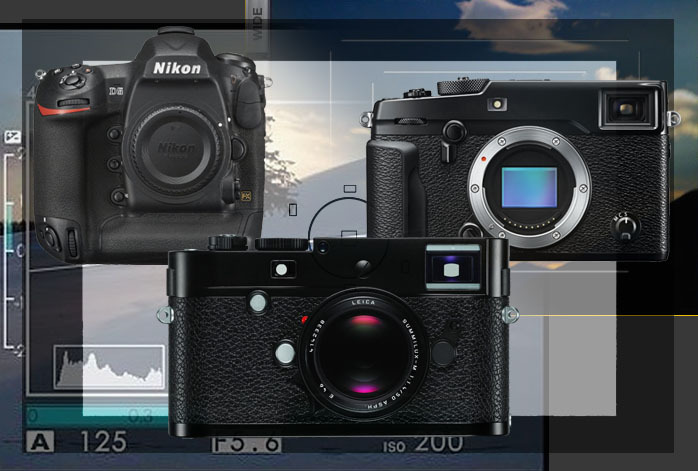 We can say that mirrorless cameras are cameras that stand in between regular digital cameras and DSLR cameras. They boast considerably stronger power than regular digital cameras, while typically featuring smaller and lighter bodies than DSLRs. Even so, thanks to the advancement of technology, many mirrorless cameras can now even rival the quality of DSLRs. However, while most of them have interchangeable lenses just like DSLRs, mirrorless cameras usually lack any optical viewfinder. When using a mirrorless camera, you can preview the picture that you are about to shoot by looking at the display screen. Well, some newer mirrorless cameras do offer built-in viewfinders in order to provide better control and framing, but almost every mirrorless camera with a viewfinder right now utilizes an Electronic Viewfinder (EVF). Only a few models have Optical Viewfinders (OVF). Now, you may ask: What are the differences between electronic viewfinders and optical viewfinders? An electronic viewfinder uses a small electronic display screen that receives images directly from the camera’s sensor. Hence, the advantage of using an electronic viewfinder is that you can see exactly what your camera’s sensor is seeing. In addition, unlike taking photos with a DSLR camera, your view of the scene will never be obstructed. Some advanced mirrorless cameras even add several advanced features to their electronic viewfinders, such as focus peaking, face detection auto-focus, and blur simulation. However, electronic viewfinders tend to have some delay time before they are fully functional again for the next shot. Many electronic viewfinders also struggle in bright light. On the other hand, an optical viewfinder uses mirrors and prisms to capture the view of the scene. It relies on the actual light that passes through the camera instead of a digital representation. Hence, optical viewfinders tend to deliver much better clarity and dynamic range in the preview, and especially an instantaneous, continuous view of the scene, without the delay found in electronic viewfinders. Another advantage of optical viewfinders is that they are completely usable and reliable even in bright light. As stated before, most mirrorless cameras are equipped with electronic viewfinders. Thus, finding one with an optical viewfinder can be very difficult. However, you shouldn’t worry. If you are looking for a mirrorless camera with optical viewfinder, we have gathered some viable models below! Leica is one of the most famous brands in photography. Best known for popularizing 35m and their iconic rangefinder cameras since the 1930s, Leica has produced a number of high-end mirrorless camera models. One of them is Leica 10773 M-P Typ 240, which features an optical viewfinder. Leica 10773 M-P Typ 240 is certainly a premium-grade mirrorless camera. Featuring a scratch-resistant display cover that is constructed of sapphire glass and a weather-sealed construction, it is very rugged, sturdy, and durable. It feels solid in the hands. It also has a decent performance, thanks to the 2GB image buffer capacity. It is armed with the LEICA MAX 24MP CMOS sensor and Leica Maestro image processor. It has a sensitivity range of ISO 200 – 6400, a maximum shutter speed of 1/4,000s, and a burst rate of 3 fps. Meanwhile, the maximum video recording quality is Full HD 1080p with 25 fps frame rate. Leica 10773 M-P Typ 240 features a manual viewfinder frame selection with a traditional frame selector, and there is an optional electronic viewfinder available. Take a look at the best deal for Leica 10773 M-P Typ 240 here! Quite interestingly, Nikon D5 is available in two variants that differ on the type of the memory card slot: CF and XQD. Choose the variant that matches the type of SD card that you want to use. Nikon D5 is built like a tank – its all-metal chassis is entirely weather-sealed, able to endure extremely wet, freezing, and dusty environments. It also offers a great degree of customizability with its number of buttons; many are backlit for ease of usage in darkness. Coming with a distinctively compact body, Nikon D5 is powered by a 20.8MP FX-Format CMOS sensor and EXPEED 5 image processor. Its max native ISO is 102,400, but it can be extended up to Hi-5 ISO 3,280,000! Indeed, Nikon D5 is specially designed to provide class-leading performance in challenging light conditions. The 153-point AF system is also quite powerful and reliable in tracking objects. Nikon D5 is already able to perform Ultra HD 4K video recording at a satisfying 30 fps frame rate. Its viewfinder is big, bright, and offers minimal blackout so that you can easily follow you photo objects even in the 12 fps continuous shooting mode. Take a look at the best deal for Nikon D5 here! Being the most affordable choice in the list, Fujifilm X-Pro2 does not compromise in anything. It is packed in a well-built, weather-sealed magnesium alloy body. It is sealed against dust and moisture, and it is operable in extreme freezing temperatures as low as 14 degrees Fahrenheit. It is certainly a very rugged and durable camera. In addition, it also features a convenient layout of direct controls for exposure compensation, ISO level, and shutter speed, while there is an AF joystick, too, which has direct access to focus points. Fujifilm X-Pro2 is armed with a 24MP X-Trans III CMOS sensor with on-sensor phase detection. Combined with the X-Processor Pro engine, Fujifilm X-Pro2 boasts excellent response times, fast AF system, and especially lower noise. Not only it can generate excellent sharpness and details, but also the colors are true, solid, and vivid. In short, its image quality is very impressive! Furthermore, Fujifilm X-Pro2 comes with a focal plane shutter with maximum speed of 1/8,000s and an electronic shutter with maximum speed of 1/32,000s. However, perhaps the primary strength and attraction of Fujifilm X-Pro2 is the unique hybrid viewfinder system. It comes with both optical and electronic viewfinders. In this aspect, Fujifilm X-Pro2 is truly unrivaled. It can give the utmost versatility in engaging a scene. You can use either the bright optical viewfinder that features LCD-projected overlays, or the electronic viewfinder that has 100% frame coverage. The hybrid viewfinder system is a truly powerful feature! Take a look at the best deal for Fujifilm X-Pro2 here!